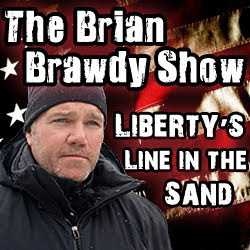 The video premiere for The Brian Brawdy Show, Liberty’s Line in the Sand at Livestream.com/brianbrawdy. As a survival expert I’m trained to survive extremes in weather, wildlife, terrains and scenarios of all types. Surviving an extreme government is the last thing I planned for. I never thought we would need to prepare for Uncle Sam poking his finger in our chests. Like many of us, I’m tired. I’m tired of ever expanding and encroaching government and the career politicians and bureaucrats that staff them. I’m tired of the political bickering that seems to get nothing done except more bickering. I’m tired of our Constitution being treated like a speed bump to the agendas of those trying to strip our freedoms at every turn. I’m tired of ever increasing taxes from the local to the federal levels and those that are busy spending and hocking our futures. I’m tired of many in the mainstream media and their near constant spin. Our heritage, our birthright is Liberty and Freedom. Today, in so many ways, economically, politically, socially those liberties are being slowly, methodically stripped away from us. Who will make a stand. Who will say NO to ever growing government and it’s bureaucrats, to say NO to continually increasing taxes. Who will say NO to throwing our grandchildren under the bus. I was born free. You were born free. It’s time to start living like it, before it’s too late. Enough, I’m drawing the Line in the Sand. Please join me and subscribe to the Show Notes at Brian Brawdy for updates and very special offers for members, until the official launch of the show.